1. Container grown plants: Carefully remove the container. Place the root system in the hole so the crown (top) of the root system is at ground level. Do not disturb roots unless directed by staff. 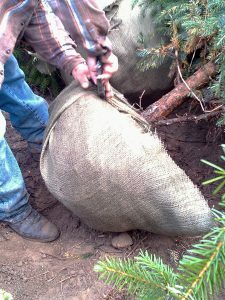 Balled and Burlap plants: LEAVE THE BURLAP ON! Situate the root ball in the hole so the crown (top) of the root ball is at ground level. Then cut the twine around the burlap. 2. For clay soils: Mix 1/3 shredded fine bark, 1/3 processed steer manure and 1/3 existing soil. 1/3 processed steer manure and 1/3 existing soil. 3. Continue to fill the hole, checking constantly that the top of the root ball remains at ground level. 4. Place hose at the base of the plant and allow the water to run at a slow trickle until the soil is completely saturated. 5. Add 2-3 inches of mulch, keeping 3 inches away from the trunk of the plant. This is critical to newly planted trees and shrubs. See step #4. All newly installed material must stay consistently moist at all times for the first year. When following the above planting instructions, we do not recommend commercial fertilizing for the first year after planting. Established plants may be applied with fertilizer of choice. 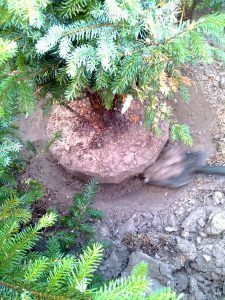 ¨ Never bury the trunk with soil or mulch. ¨ Maintain an even and deep level of moisture!